Mr Lang, Johnny Rabb and bands like Lamb Of God and Shadows Fall, all speak highly of Meinl's cymbal range. And the Byzance Fast hi-hats do nothing but reinforce the company's superior reputation for top-notch products at the pro level. They're nicely voiced, with plenty of power, and do exactly what your hands and feet tell them to. A great combination of looks, responsiveness and tone. Might be a touch thick-sounding for lighter funk. Byzanze Fast hi-hats are a production collaboration between Meinl and Austrian-born drummer Thomas Lang, whose credits include The Clash, Robbie Williams and Bonnie Tyler. This isn´t the first time Thomas has teamed up with the good folk at Meinl either. Back in 2002, he collaborated on the Tom´s Becken line, designing a range of innovative crashes for electronically-inspired dance music. This endeavour is altogether more traditional, both in terms of looks and construction. Available in 13" and 14" sizes, Meinl describes the Byzance line as traditional and individual, whereas the Generation X Tom´s Becken cymbals are all about pushing boundaries and using non-traditional alloys. As such, the Fast hi-hats are made from B20 alloy, with 80 percent copper and 20 percent tin, and look aesthetically far more ‘normal´. Having said that, there are a couple of crucial features that set these babies apart from the rest of the crowd. The first is that the top and bottom cymbals are finished rather differently from one another. The bottom has Meinl´s Dark finish, with an untreated surface and very heavy hammering marks, while the top is Brilliant and highly polished. In addition, the top cymbal has eight small holes drilled toward its edge to allow the speedy exit of air when the two cymbals are brought crashing together. Meinl says the Dark bottom cymbal is designed to produce earthy tones, with short sustain and plenty of low end. This is apparently balanced by the bright, but rich characteristics of the top cymbal. We´ll find out if these claims are justified shortly, but in terms of appearance, everything´s just dandy. The heavier bottom cymbal looks gorgeous, in a moody, rugged sort of fashion, with its speckled, neo-leopard-print hammering hinting at plenty of raw, dark tonal response. The glistening polished finish of the top is alluring too, as is the fact that Thomas´s moniker doesn´t appear on the cymbals at all. The top simply features the Meinl logo and the simple-script Byzance marking, along with the tiny product description below. As a result, they look highly professional yet understated at the same time. There´s been a variety of solutions to the problem of moving air from between hi-hats, with Paiste´s Sound Edge, Zildjian´s grooved Mastersounds and Sabian´s vented Fusion Hats all prime examples. 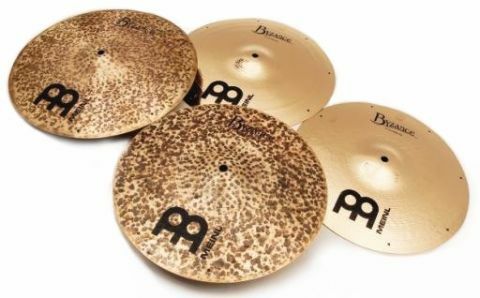 The Meinl way of doing things with the Fast hats, however, is completely different to any of these (given that the holes are drilled in the top of the pair), but seems to make sense. Clearly, the thinking behind the holes´ positioning is that as air shifts to the edge of the cymbals, it can exit from the edge as normal, or whizz through the little vents. In practice, there´s certainly no denying that the Fast hi-hats are snappy little numbers. The bottom cymbal is fairly heavy, with the raw finish adding to the perception of weight. And while the top isn´t paper-thin, it´s light enough to add a quick attack and lively response to the overall voicing. Predictably, the 13"s are the higher-pitched, less ‘woofly´ of the pair here, and definitely the hi-hat of choice for those who want ultra-controllable pedal sounds and a tight stick sound. But there´s still real depth and meat to the smaller offering. That bottom cymbal contributes a nice thick low-end, and the lower mid-frequencies are gutsy and muscular, making for a generally powerful character that´s balanced by the articulate nature of the top end. The smaller cymbals are good and loud too, and when played half-open, deliver a driving, well-balanced wash that remains crisp and defined. This combination suggests they´d be fabulous in the studio where clarity and sonic space between elements of the kit are paramount. Replacing the 13"s with the 14"s leads to a crunchy, lower-pitched roar. They respond well to movements of the pedal, and the front edge of each stroke is quick to leap out, but the grunt of the 14"s is pushed well to the fore. This is the ‘rock´ pair, and no mistake. Even so, the manner in which they fit into the mix of a kit is exemplary. Thomas speaks of his desire for cymbals to exhibit a short, tight sustain, and that´s exactly what we have here. The bigger hi-hats certainly make their presence known, but they don´t get in the way of a well-tuned snare and kick. Thomas uses both the 13"s as his main pair and the 14"s situated to his right-hand side, but if you´re playing louder, frenetic rock or metal, the 14"s on their own make a great choice.